How to make your home windows secure? Security experts warn that unlocked or weak doors and windows are number one threat to the home security. Unfortunately, windows are often the most overlooked components in the whole equation. 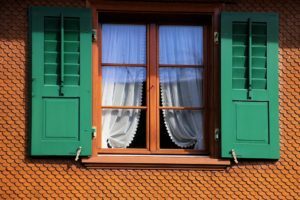 What can you do to make your home windows secure and why does it matter? An average burglar is looking for an easy way out to gain entry. Using destructive methods and spending too much time around the house to manipulate locks and access control system is not what a burglar is looking for. It is asking for attention, which is something they want to avoid at any cost. Unprotected and old windows present such easy opportunities, making your home a potential target for break-ins and burglaries. Install a high-quality window lock that is visible from the outside and add additional locks if possible. Install security bars or metal grilles on glass windows. Add a protective film on windows to lend the glass more strength. This works two ways. One, this action prevents burglars to get easy entry by simply breaking or smashing down the glass. Secondly, tinted films prevent burglars from sizing up your house from outside. Install windows security screens, which work like bug screens or insect screens, but they are made of a much stronger, resilient material like steel. Install window sensor alarm, that will promptly sound an alarm if the window is broken or opened. There are all kinds of alarms for windows, for example that alerts you in case there is unexpected motion around the windows. Install floodlights over your windows. It not only works for your entrance but also for your windows. Bright lights make burglars think twice before they plan to strike. This is also a sign that there people in the house and it could be risky to attack. Make sure your home security alarm is integrated with windows too. While planting thorny bushes under the windows could work as a great thief deterrent, avoid having trees that have sturdy trunks anywhere near your windows. Such trees could work as ladders or platform to climb over and enter the windows. If you are looking to install new locks or extra locks to make your home windows secure, Racine’s Lock & Key can help. We are experts in residential locksmiths and home security solutions and can help you with a range of services – such as door locks installation, digital peephole camera, high security locks, windows locks, garage door locks and so much more. If you are ever stuck with a lost key, call us at any hour of the day. Our licensed and insured residential locksmith in Racine are available 24/7 to rescue you from any annoying, untimely and unexpected lockout situation. Whether your keys are broken off in the lock or locked inside the house, call Racine’s Lock & Key at (262) 509-0366 and you will find a friendly, skilled and trusted technician at your doorsteps within minutes. Give us a call today!